A tornado is a violently rotating column of air from a thunderstorm that reaches the ground. Tornadoes usually occur east of the Rocky Mountains during the spring and summer. May is typically the worst month. On average, 800 tornadoes hit the United States each year. They kill 80 people and injure 1,500 more. Since 2008, that average has increased to more than 1,300 injured a year. The most violent tornadoes have wind speeds of more than 250 mph and leave a damage path a mile wide and 50 miles long. In 2017, there were 1,400 tornadoes. The first quarter was the worst for insurers in 20 years. Tornadoes were a large part of that. There were 425 tornadoes between January and March. That's more than double the 205 tornadoes during the same period in 2016. On average, there were 93 tornadoes in each the first quarters of 2014 through 2016. It's unusual for tornadoes to occur that early in the year. Fortunately, only 35 people died. The opposite was true in 2018. The first six months saw half the normal amount. The most damaging tornado ever was May 22, 2011, in Joplin, Missouri. It cost $2.8 billion. That's $3.2 billion when adjusted for inflation. This tornado was the deadliest since 1950. It killed161 people and injured more than 1,000. It also damaged more than 500 businesses, affecting 5,000 workers. The EF-5 tornado was one-half mile wide when it touched down in the western part of the city. It expanded to three-fourths mile in width. Winds were 200 miles per hour. The tornado covered 13 miles in all, hitting the City of Duquesne as well. It traveled about 10 miles per hour. A tornado's damage level depends on whether it hits rural or urban areas. The most damaging tornado season occurred April 25-27, 2011. In that week, 362 twisters hit the Southeast, breaking the 1974 record of 267 tornadoes. The outbreak caused $11 billion in damage. At least two of the storms were EF-5 twisters, producing wind gusts of more than 200 miles per hour. The tornado outbreak killed 321 people, with 250 dead in Alabama alone. It was the third-deadliest single outbreak in U.S. history. The worst was March 1925, when 747 people died. The second-worst was March 1932, when 332 perished. That outbreak made April the most active month for tornadoes ever, with 600 tornadoes forming. The previous record was 542 tornadoes in May 2003. It also brought the year's total to 881 tornadoes, almost half the tornado record of 1,817 set in 2004. Tornado-producing thunderstorms develop in warm, moist air in advance of eastward-moving cold fronts with dry air, known as a "dryline." The United States has more tornados than anywhere else in the world. That's due to a combination of three factors. It has a large land mass, the Great Plains, that warms on hot days. The area is pummeled by cold, dry winds from the Rockies and warm, moist air from the Gulf of Mexico. The earth's jet stream swoosh all these together to create Tornado Alley. Some say global warming is increasing tornado damage. The Gulf of Mexico is becoming warmer. That allows the atmosphere to hold more moisture. It increases the contrast when it hits the cold air from the Rockies. But others argue that climate change is reducing the number of tornadoes. They contend the Gulf air warms the cold air from the Rockies, creating less wind shear. Tony Del Genio, research scientist at the National Aeronautics Space Administration, found that tornado activity may be on the rise. Del Genio developed a computer model to research the impact of global warming on tornado activity. According to his research, global warming increases the likelihood of strong updrafts. That's when the wind moves up and down instead of sideways, which is like an incubator for tornadoes. The computer model predicted that global warming would create the conditions most likely to result in the most damaging tornadoes. Most researchers agree that there is a tipping point. If temperatures exceed the Paris Climate Agreement's goal of 2 degreesCelsius, it will increase the number of tornadoes. 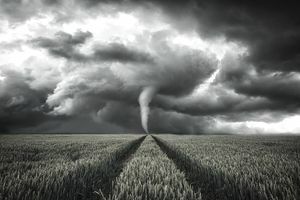 Global warming may be shifting tornadoes eastward, according to a recent study published in the journal Climate and Atmospheric Science. Since 1980, the states east of the Mississippi have experienced more tornadoes while the Great Plains and Texas have seen fewer. That could lead to more death and destruction since the east is more populated than the west. Climate change is drying out the Great Plains. Global warming has expanded the dry western Plains region 140 miles eastward. The "100th meridian" runs north to south through Texas, Oklahoma, Kansas, Nebraska, and the Dakotas. It separates the humid East from the dry West. It's now at the 98th meridian. Tornadoes breed among thunderstorms that form at the edge of dry and moist air. As that edge moves eastward, tornados occur along with it.